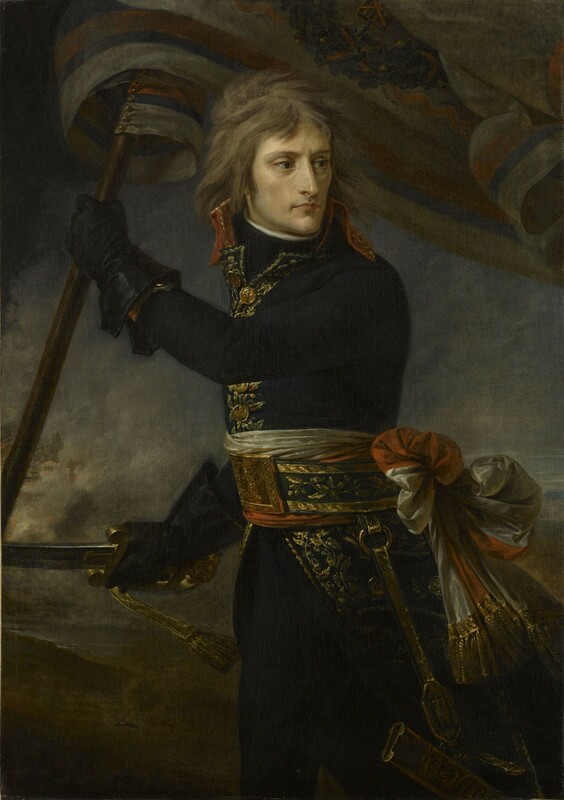 15 August 1769 – 5 May 1821) was a French military and political leader who rose to prominence during the latter stages of the French Revolution and its associated wars in Europe. 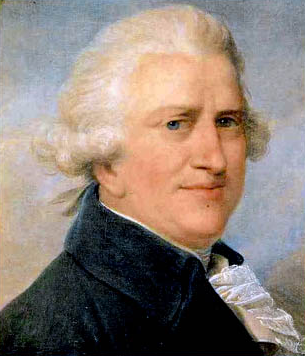 Napoleon's father, Carlo Buonaparte, was Corsica's representative to the court of Louis XVI of France. 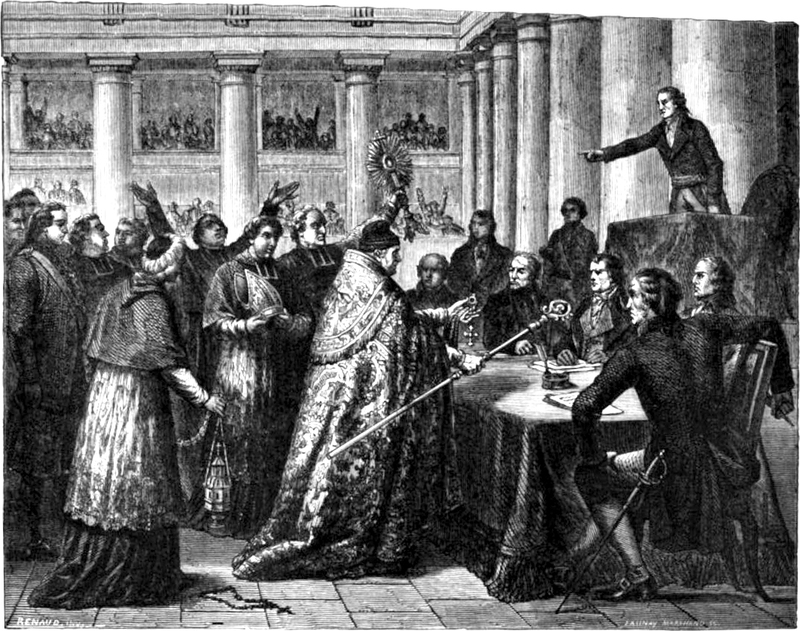 Napoleon was crowned Emperor Napoleon I on 2 December 1804 at Notre Dame de Paris by Pope Pius VII. On 1 April 1810, Napoleon religiously married the Austrian princess Marie Louise. During his brother's rule in Spain, he abolished the Spanish Inquisition in 1813. In a private discussion with general Gourgaud during his exile on Saint Helena, Napoleon expressed materialistic views on the origin of man,[note 10]and doubted the divinity of Jesus, stating that it is absurd to believe that Socrates, Plato, Muhammad and the Anglicans should be damned for not being Roman Catholics. [note 11] He also said to Gourgaud in 1817 "I like the Mohammedan religion best. It has fewer incredible things in it than ours." and that "the Mohammedan religion is the finest of all". 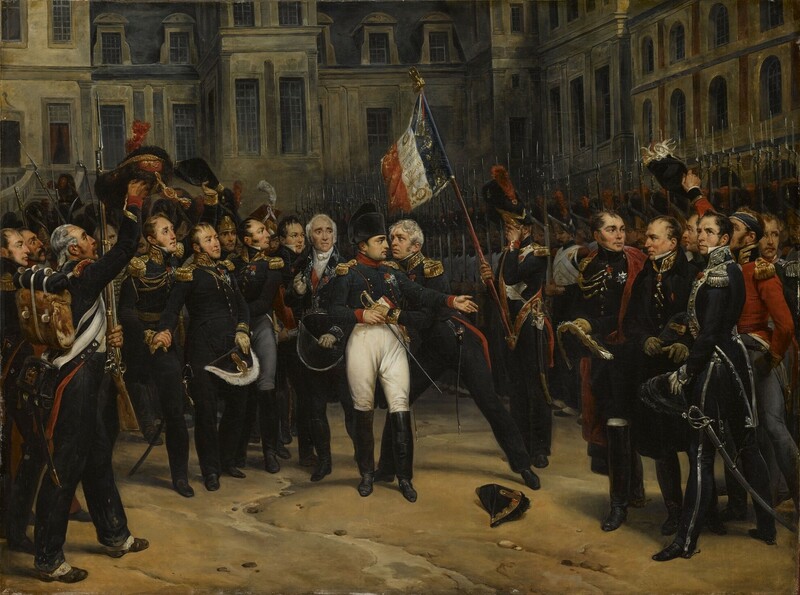 However, Napoleon was anointed by a priest before his death. Napoleon is often represented in his green colonel uniform of the Chasseur à Cheval, with a large bicorne and a hand-in-waistcoat gesture. Napoleon institutionalised plunder of conquered territories: French museums contain art stolen by Napoleon's forces from across Europe. Artefacts were brought to the Musée du Louvre for a grand central museum; his example would later serve as inspiration for more notorious imitators. He was compared to Adolf Hitler most famously by the historian Pieter Geyl in 1947 and Claude Ribbe in 2005. David G. Chandler, a historian of Napoleonic warfare, wrote in 1973 that, "Nothing could be more degrading to the former and more flattering to the latter." ↑ This is depicted in Bonaparte Crossing the Alps by Hippolyte Delaroche and in Jacques-Louis David's imperial Napoleon Crossing the Alps, he is less realistically portrayed on a charger in the latter work. ↑ Napoleon gave the pope a tiara following the ceremony, now referred to as the Napoleon Tiara. ↑ A custom in which householders place candles in street-facing windows to herald good news. ↑ It was customary to cast a death mask or mold of a leader. Four genuine death masks of Napoleon are known to exist: one in The Cabildo, a state museum located in New Orleans, one in a Liverpool museum, another in Havana and one in the library of the University of North Carolina. ↑ "Nous trompons les Égyptiens par notre simili attachement à leur religion, à laquelle Bonaparte et nous ne croyons pas plus qu'à celle de Pie le défunt." ↑ "I do not think Jesus Christ ever existed. I would believe in the Christian religion if it dated from the beginning of the world. That Socrates, Plato, the Mohammedan, and all the English should be damned is too absurd. Jesus was probably put to death, like many other fanatics who proclaimed themselves to be prophets or the expected Messiah. Every year there were many of these men." ↑ Napoleon's height was 5 ft 2 French inches according to Antommarchi at Napoleon's autopsy and British sources put his height at 5 foot and 7 British inches: both equivalent to 1.7 m. Napoleon surrounded himself with tall bodyguards and had a nickname of le petit caporal which was an affectionate term that reflected his reported camaraderie with his soldiers rather than his height. ↑ 1.0 1.1 Schom, Alan (1998). 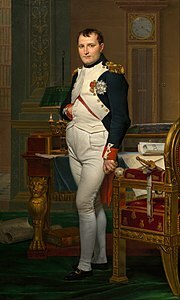 Napoleon Bonaparte (1. HarperPerennial ed.). New York: HarperPerennial. ISBN 0-06-092958-8. ↑ 2.0 2.1 Delors, Catherine. "15th of August 1769: birth of Napoleone di Buonaparte". 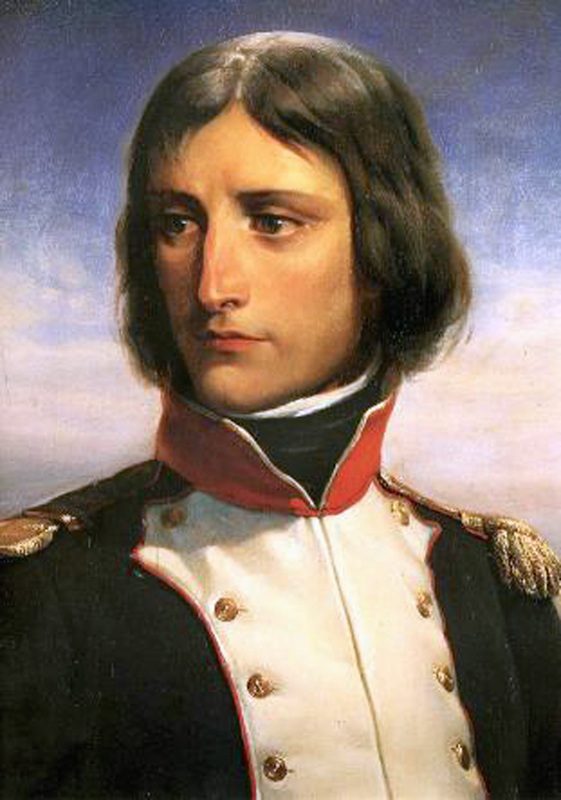 http://blog.catherinedelors.com/15th-of-august-1769-birth-of-napoleone-di-buonaparte/. Retrieved 3 November 2012. ↑ The other conquest. Harper & Row. 1967. http://books.google.com/?id=zNNBAAAAIAAJ. Retrieved 3 August 2011. ↑ French Fortifications, 1715–1815. McFarland. 30 November 2009. ISBN 9780786458073. http://books.google.com/?id=aeVAPShsbTMC&pg=PA17. Retrieved 3 August 2011. ↑ 2012 DNA tests found some of the family's ancestors were from the Caucasus region; lefigaro.fr (15 January 2012). "Le Figaro – Mon Figaro : Selon son ADN,les ancêtres de Napoléon seraient du Caucase!". Le Figaro. http://www.lefigaro.fr/mon-figaro/2012/01/15/10001-20120115ARTFIG00193-selon-son-adnles-ancetres-de-napoleon-seraient-du-caucase.php. Retrieved 20 February 2012. ; The study found haplogroup type E1b1c1*, which originated in Northern Africa circa 1200 BC; the people migrated into the Caucasus and into Europe. "Haplogroup of the Y Chromosome of Napoléon the First; Gerard Lucotte, Thierry Thomasset, Peter Hrechdakian; Journal of Molecular Biology Research". December 2011. http://www.ccsenet.org/journal/index.php/jmbr/article/view/10609/. Retrieved 18 February 2012. ↑ Harvey, R. The War of Wars, Robinson, 2006. pp.58–61. ↑ "Cathedral—Ajaccio". La Fondation Napoléon. http://www.napoleon.org/en/magazine/museums/files/Cathedral-Ajaccio.asp. Retrieved 31 May 2008. ↑ Woolley, Reginald Maxwell (1915). Coronation Rites. Cambridge University Press. pp. 106–107. http://books.google.com/?id=gcs7AAAAIAAJ&pg=PA106. 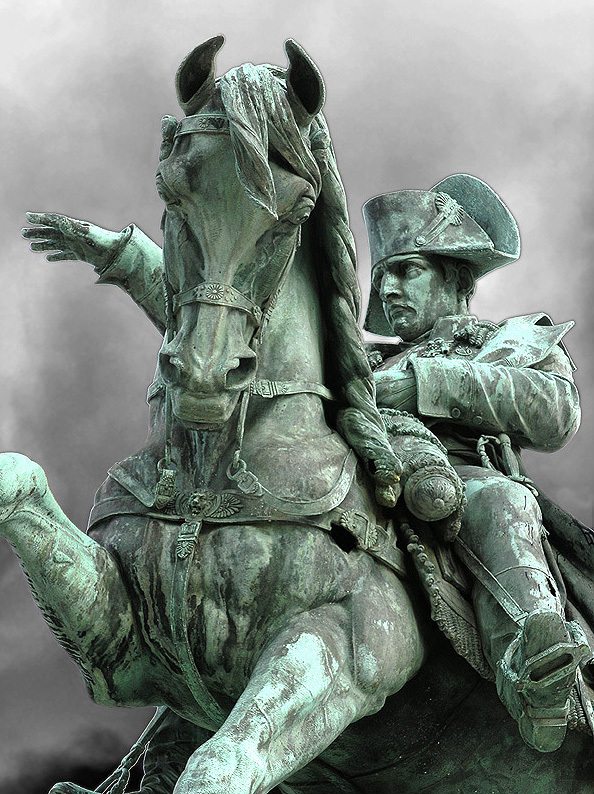 ↑ "Napoleon's act of abdication". 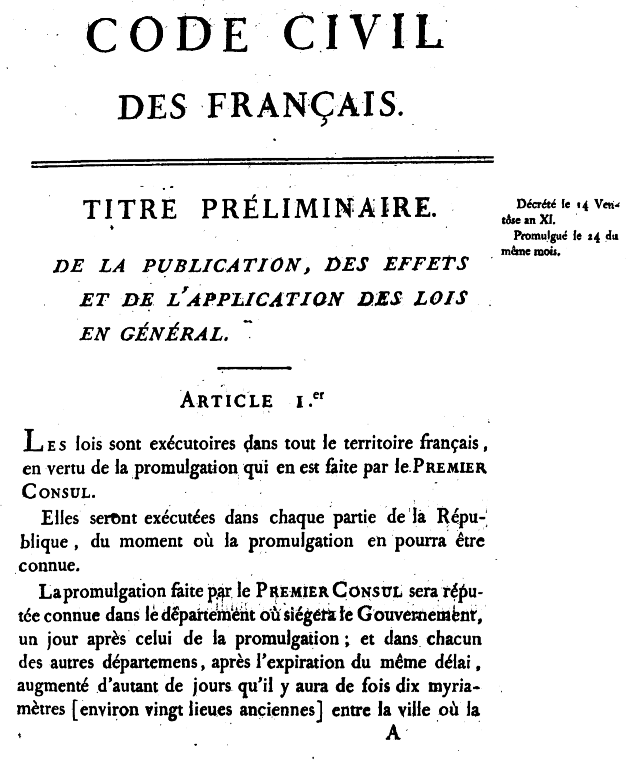 Bulletin des lois de la Republique Française. http://gallica.bnf.fr/ark:/12148/bpt6k4861135.pleinepage.f57.langFR. Retrieved 28 August 2009. ↑ Hallock, William; Wade, Herbert T (1906). "Outlines of the evolution of weights and measures and the metric system". London: The Macmillan Company. pp. 66–69. http://www.archive.org/stream/outlinesofevolut00halluoft/outlinesofevolut00halluoft_djvu.txt. ↑ Denis Février. "Un historique du mètre" (in French). Ministère de l'Economie, des Finances et de l'Industrie. http://www.industrie.gouv.fr/metro/aquoisert/metre.htm. Retrieved 10 March 2011. ↑ Thierry Sabot (1 October 2000). "Les poids et mesures sous l’Ancien Régime" (in French). The weights and measures of the Ancien Régime. histoire-genealogie. http://www.histoire-genealogie.com/spip.php?article396. Retrieved 10 February 2011. ↑ 163.0 163.1 163.2 163.3 "L'Empire et le Saint-Siège". Napoleon.org. http://www.napoleon.org/fr/salle_lecture/articles/files/Empire_Saint-Siege_Napoleon_religion.asp. Retrieved 15 June 2011. ↑ "Revue des Deux Mondes – 1867 – tome 71, p.386" (in fr). Fr.wikisource.org. http://fr.wikisource.org/wiki/Page:Revue_des_Deux_Mondes_-_1867_-_tome_71.djvu/386. Retrieved 15 June 2011. ↑ "Bonaparte and Islam.". Center for History and New Media at George Mason University. http://chnm.gmu.edu/revolution/d/612/. Retrieved 12 July 2012. ↑ "Napoleon: Man of Peace". Napoleon-series.org. 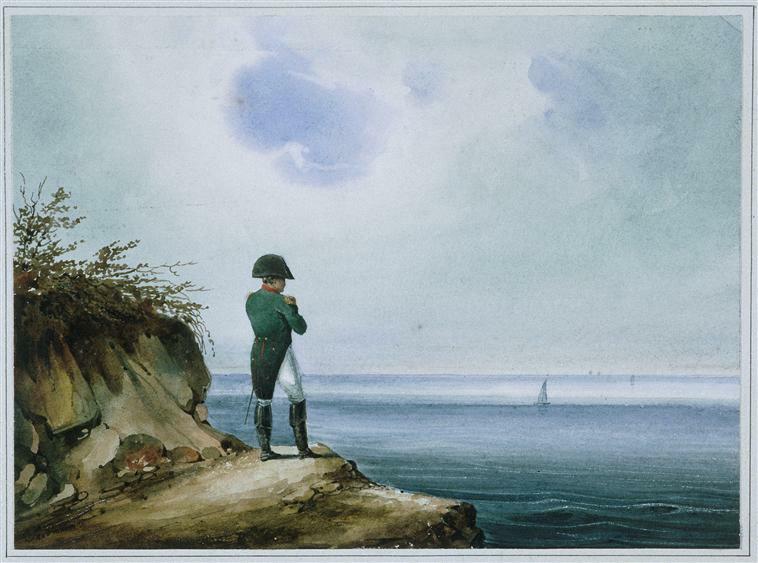 17 November 1999. http://www.napoleon-series.org/ins/weider/c_peace.html. Retrieved 4 November 2011. ↑ Louis Antoine Fauvelet de Bourrienne, Memoirs of Napoleon Bonaparte. Scott, Webster & Geary. 1839. p. 586. http://books.google.com/?id=rlY2AAAAMAAJ&pg=PA586. Retrieved 5 February 2011. ↑ Aston, Nigel (2002). Christianity and Revolutionary Europe c. 1750–1830. Cambridge University Press. ISBN 0-521-46027-1. ↑ Jack Coggins (1966). Soldiers And Warriors: An Illustrated History. Courier Dover Publications. p. 187. http://books.google.com/?id=V8qaEDqjkv0C&pg=PA187. ↑ 179.0 179.1 See David Chandler, "General Introduction" to his Chandler, David. The Campaigns of Napoleon: the Mind and Method of History's Greatest Soldier (1975). ↑ Sally Waller (2002). 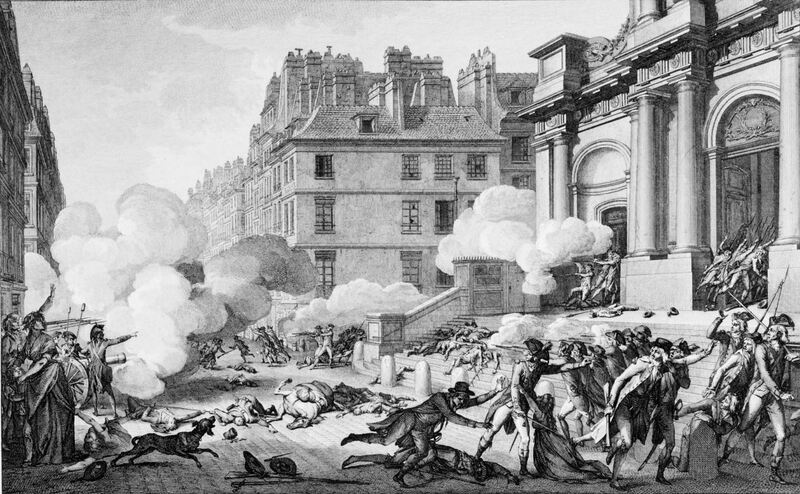 France in Revolution, 1776–1830. Heinemann. p. 188. http://books.google.com/?id=d0KywNq8wJgC&pg=PA188. ↑ Gregory R. Copley (2007). The Art of Victory: Strategies for Personal Success and Global Survival in a Changing World. Simon and Schuster. p. 97. http://books.google.com/?id=tM0Zjzok8nsC&pg=PA97. ↑ Christopher Hibbert (1999). Wellington: A Personal History. Da Capo Press. p. 171. http://books.google.com/?id=Ni8Mc1b1ygAC&pg=PA171. ↑ "Sarkozy height row grips France". BBC. 8 September 2009. http://news.bbc.co.uk/2/hi/europe/8243486.stm. Retrieved 13 September 2009. ↑ Repa, Jan (2 December 2005). "Furore over Austerlitz ceremony". BBC. http://news.bbc.co.uk/2/hi/europe/4491668.stm. Retrieved 5 April 2010. ↑ 205.0 205.1 Hudson, Christopher (24 July 2008). "The French Fuhrer: Genocidal Napoleon was as barbaric as Hitler, historian claims". http://www.dailymail.co.uk/news/article-1038453/The-French-Fuhrer-Genocidal-Napoleon-barbaric-Hitler-historian-claims.html. Retrieved 21 October 2013. ↑ "Call for Papers: International Napoleonic Society, Fourth International Napoleonic Congress". La Fondation Napoléon. http://www.napoleon.org/en/magazine/presse_review/files/dinard_callforpapers.asp. Retrieved 27 June 2008. ↑ Laurent, Ottavi (8 February 2012). 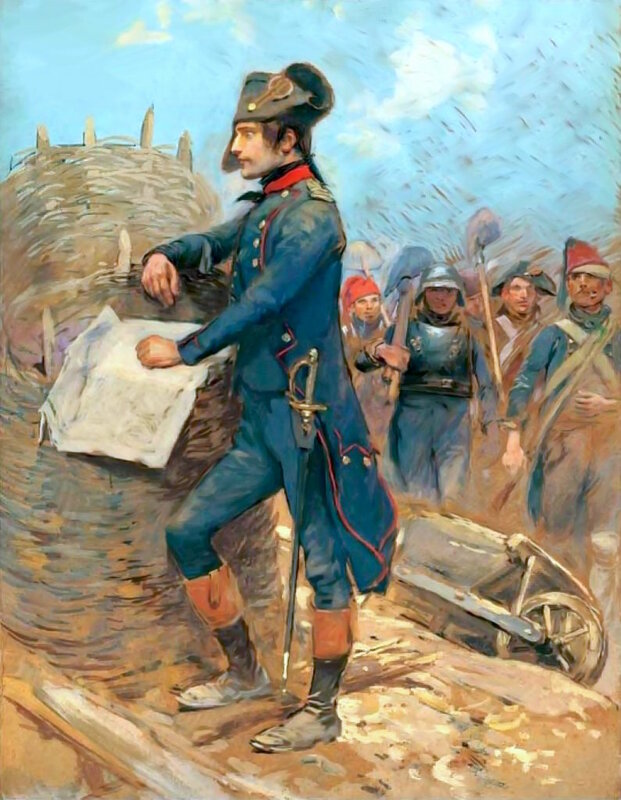 "A New Napoleonic Campaign for Montereau". Foundation Napoleon. 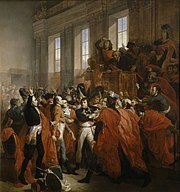 http://www.napoleon.org/en%5Creading_room%5Carticles%5Cfiles%5C480813.asp. ↑ "Napoleonic Code". Encyclopædia Britannica. http://www.britannica.com/EBchecked/topic/403196/Napoleonic-Code. Retrieved 13 April 2012. Bertman, Sandra (2002). "Execution of the Defenders of Madrid, 3 May 1808". New York University. http://litmed.med.nyu.edu/Annotation?action=view&annid=10375. Retrieved 18 November 2008. Dunan, Marcel (1963). "Napoleon's height" (in French). La Fondation Napoléon. http://www.napoleon.org/fr/salle_lecture/articles/files/Taillenapo_RIN_89_oct1963_2006.asp. Retrieved 11 January 2009. Fulghum, Neil (2007). "Death Mask of Napoleon". University of North Carolina. http://www.lib.unc.edu/ncc/gallery/napo.html. Retrieved 4 August 2008. Hanson, Victor Davis (2003). 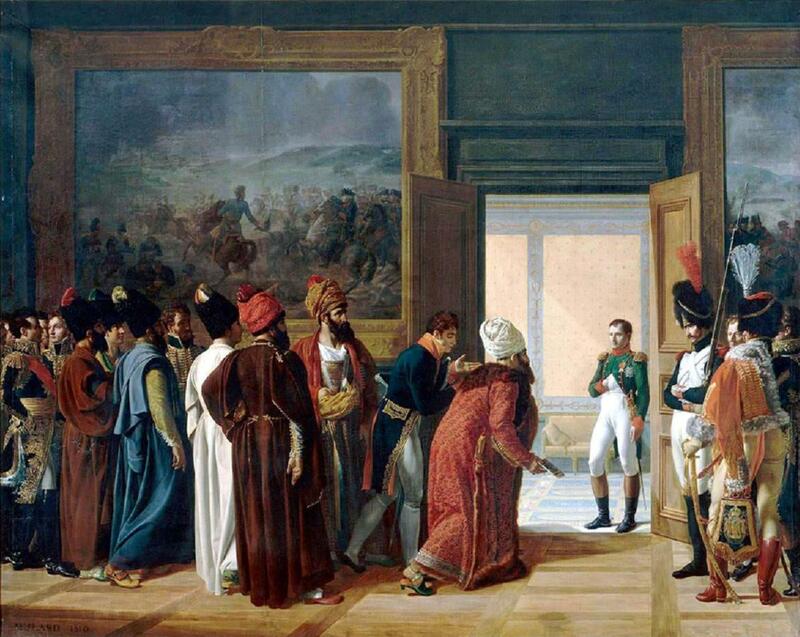 "The Claremont Institute: The Little Tyrant, A review of Napoleon: A Penguin Life". The Claremont Institute. http://www.claremont.org/publications/crb/id.1038/article_detail.asp. Retrieved 30 May 2008. Hindmarsh, J. Thomas; John Savory (2008). "The Death of Napoleon, Cancer or Arsenic?". American Association for Clinical Chemistry. p. 2092. Digital object identifier:10.1373/clinchem.2008.117358. http://www.clinchem.org/cgi/reprint/54/12/2092. Retrieved 10 October 2010. Hudson, Christopher (24 July 2008). "The French Fuhrer: Genocidal Napoleon was as barbaric as Hitler, historian claims". http://www.dailymail.co.uk/news/article-1038453/The-French-Fuhrer-Genocidal-Napoleon-barbaric-Hitler-historian-claims.html. Retrieved 21 October 2013. Johnson, P. (2002). Napoleon: A life. Penguin Books. ISBN 0-670-03078-3. http://www.amazon.com/Napoleon-Penguin-Lives-Paul-Johnson/dp/0670030783/. Markham, Felix (1988). Napoleon. Mass Market Paperback. ISBN 0-451-62798-9. http://www.questia.com/PM.qst?a=o&d=10369968. McLynn, Frank (1998). Napoleon. Pimlico. ISBN 0-7126-6247-2. http://www.amazon.co.uk/Napoleon-Frank-McLynn/dp/0712662472. O'Connor, J; E F Robertson (2003). "The history of measurement". St Andrew's University. http://www-history.mcs.st-andrews.ac.uk/HistTopics/Measurement.html. Retrieved 18 July 2008. Poulos, Anthi (2000). "1954 Hague Convention for the Protection of Cultural Property in the Event of Armed Conflict". HeinOnline. http://heinonline.org/HOL/LandingPage?collection=journals&handle=hein.journals/ijli28&div=12&id=&page=. Thomson, Kathleen (1969). "Balcombe, Alexander Beatson (1811–77)". Australian Dictionary of Biography Online. http://www.adb.online.anu.edu.au/biogs/A030078b.htm. Retrieved 27 May 2008. Watson, William (2003). Tricolor and crescent. Greenwood Publishing Group. ISBN 0-275-97470-7. http://books.google.com/?id=o4vrUbMK5eEC&pg=PA13. Retrieved 12 June 2009. Wilson, J (2 August 1975). "Dr. Archibald Arnott: Surgeon to the 20th Foot and Physician to Napoleon". pp. 293–5. Digital object identifier:10.1136/bmj.3.5978.293. PMC 1674241. PMID 1097047. Woodward, Chris (July 2005). 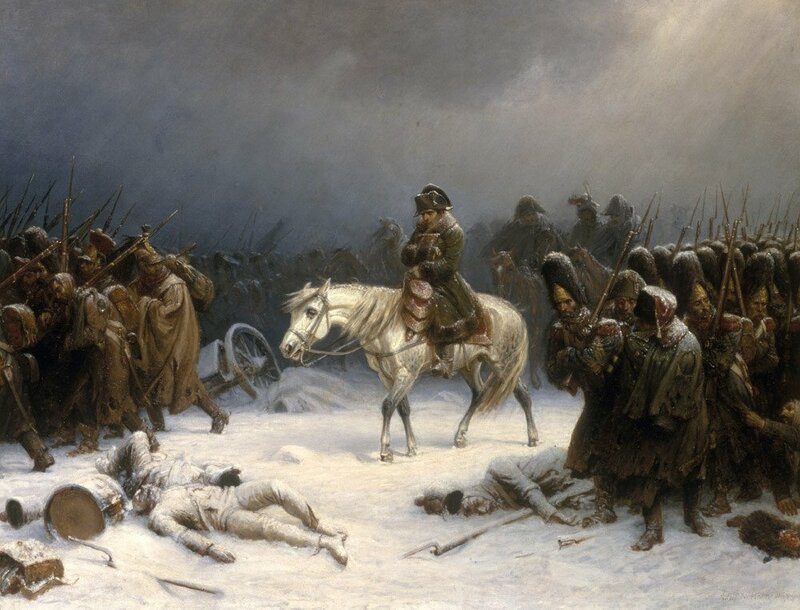 "Napoleon's Last Journey". History Today. Archived from the original on 25 April 2008. http://web.archive.org/web/20080425054948/http://www.historytoday.com/MainArticle.aspx?m=31103&amid=30222626. Retrieved 12 July 2008.